Once it is determined where to fish, the scientists also have to decide which trawl to deploy and tow behind the ship in order to catch the targeted fish. The most common trawl we use to catch mid-water pollock is the Aleutian wing trawl (AWT). Our AWT is 140 meters long, and it can be fished anywhere from 30-1,000 meters underwater. A net echosounder is mounted at the top of the net opening and transmits acoustic images of fish going in the mouth of the net in real time to a display on a computer on the bridge that is monitored by the scientist and the Lead Fisherman. Additionally, at the entrance of the codend (the end of the net where the fish are collected), a stereo camera called the CamTrawl takes pictures of anything entering the codend. CamTrawl pictures are later analyzed to determine species and lengths of the fish that were caught. Sometimes the net is fished with the codend opened and the catch is only evaluated based on what is seen in the CamTrawl images. 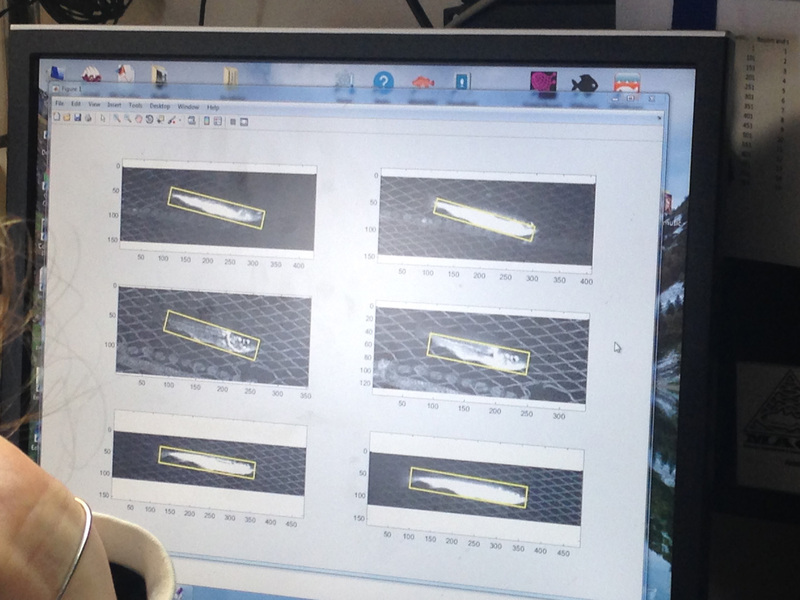 As this technology gets perfected less fish will need to be brought onboard. A view of the stern as the deck crew prepares to deploy the AWT. Note the AWT on the net reel at the bottom of the frame. Cooperation among many different people is necessary during a trawl. The wet lab team prepares the CamTrawl to collect data. 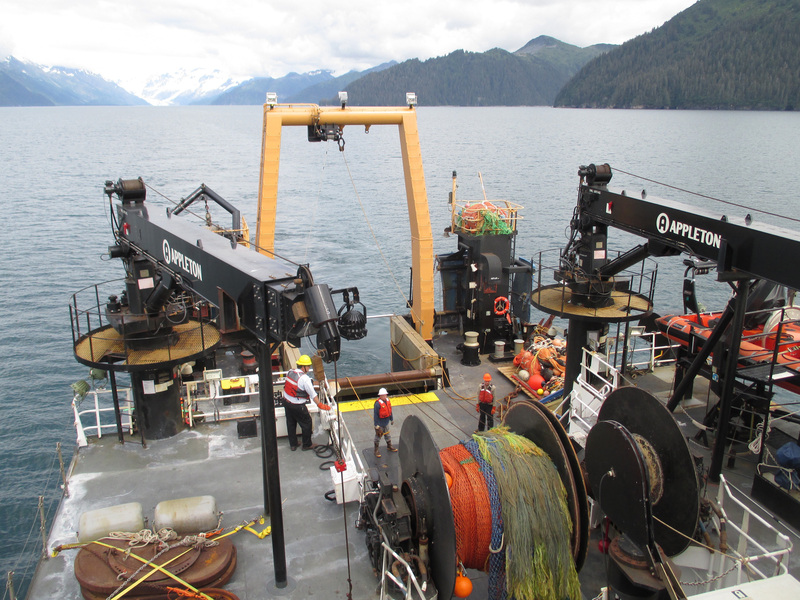 The deck crew physically handles all the gear on deck, including attaching the CamTrawl camera, net echosounders, and physical oceanography instruments to the net and deploying and recovering the net. From the bridge, the Lead Fisherman controls the winches that move the trawl net in and out of the water. Once the trawl net is in the water, the scientists work closely with the Lead Fisherman and the officers to ensure a safe, effective trawl. Sometimes the trawl net will be down for a few minutes, and other times it will be closer to an hour. 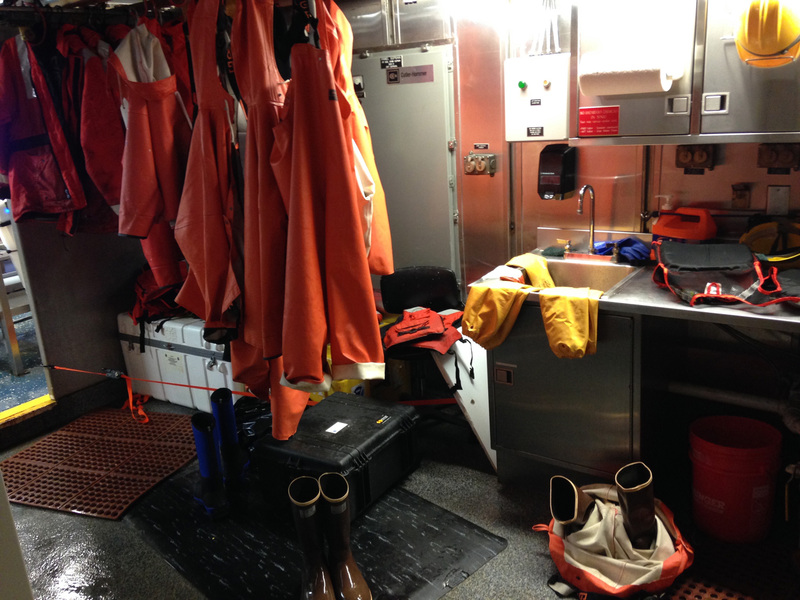 Once the net is back on the ship and emptied out, the catch and CamTrawl images are ready to be analyzed by the scientist and wet lab team. Fish are filmed in stereo so scientists can run a program that calculates their length. Two other nets, more seldom used, are the bottom trawl net, known as the Poly Nor’easter (PNE) and the Methot net, used to catch krill and zooplankton. The PNE is deployed if there is a large concentration of fish close to the ocean floor. It is smaller than the AWT and it is usually lowered to just above the ocean floor. The Methot net was named after Dr. Richard Methot, a famous fisheries modeler who designed the net. This net has an opening of 5 square meters, and it has a finer mesh than the AWT or the PNE. At the end of the net is a small PVC codend where the sample is taken from. What is your position on the Oscar Dyson? I am the Lead Fisherman and also sailing as active Chief Boatswain. What training or education do you need for your position? I went to Cal Poly San Luis Obispo and got a BS in Natural Resource Management. I have certifications from the Coast Guard like an AB (Able-Bodied Seaman) unlimited, which means I have over 1070 days sailing as an AB. I also have a Masters license to operate a 100-ton vessel. You need a lot of fishing experience. Fishing! Obviously. You just never know what you are going to get, and it’s always exciting. Have you had much experience at sea? 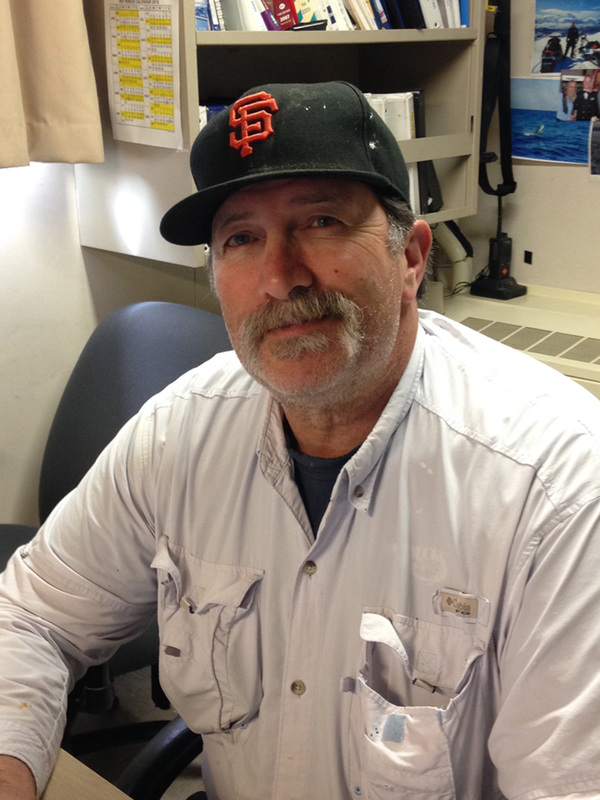 I have been fishing since I was 10 years old and I helped a neighbor build a boat and go salmon fishing in Monterey Bay. When I visited family in Hawai’i, we would go trolling, set net fishing, beach casting, and spearfishing. I have been sailing professionally with NOAA for 11 years on different vessels in Hawai’i, Mississippi, and here in Alaska. Where do you do most of your work aboard the ship? What do you do? As Lead Fisherman I operate the machinery from the bridge when we are trawling. Basically, I get the fishing gear in and out of the water safely. As Chief Boatswain, I am in charge of the Deck Department, so I schedule crew, assign daily crew duties, maintain supply inventories, oversee the ship’s survival gear, and operate deck equipment like winches, anchor, and cranes. When did you know you wanted to pursue a marine career? By 25 years old I knew I had to be on the water, full time, all the time, but I did not get to be here until I was 44 years old. When I’m not fishing, I like to hunt. Mainly ducks and geese. What do you miss most while working at sea? Home, my family. And my own bed! Tuna because they are so fast powerful and so delicious! When you are fishing for them, it’s like nothing else. It can turn into a wide open frenzy. 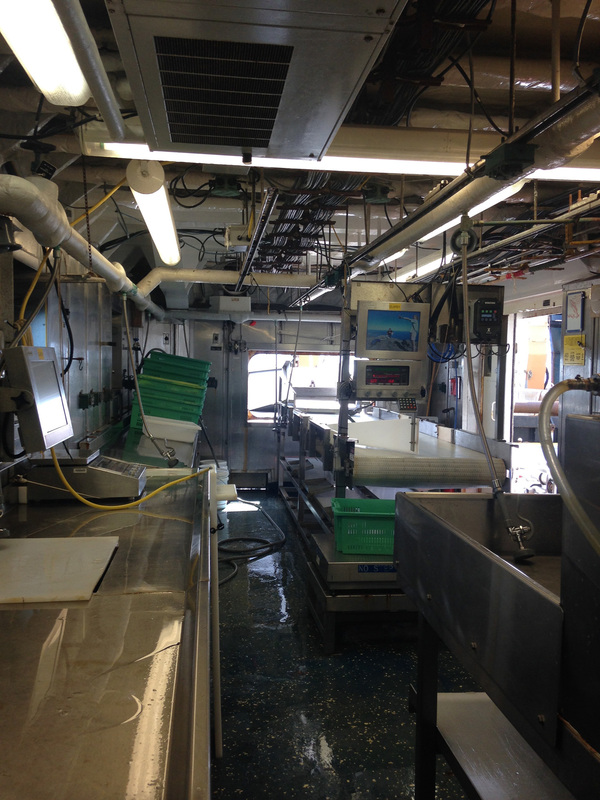 The wet lab is where we do most of our work, and it gets really busy in here after a trawl. It is called a “wet” lab because it is designed to get just that. When a trawl net is full of fish, it is emptied onto a table that tilts onto a conveyor belt feeding into the wet lab. We have controls to run the conveyor belt as well as tilt the tableAs the fish are brought in on the conveyor, we sort them in large and small baskets, and then collect data from the different species. The metal counters, outfitted with electronic balances and automated length readers provide us with workspace to process our samples. The work of the wet lab is messy and fun. When we process a catch, fish scales get everywhere! The shiny, sticky little discs coat every surface, especially areas that you touch like the computer screens and handles. It is fun to clean this lab because you spray everything down with the salt water from hoses that are rigged from the ceiling. You can even spray down the computer screens themselves, and then rinse them with fresh water. Water washes over everything and drips down, entering drains in troughs along the edges of the floor. 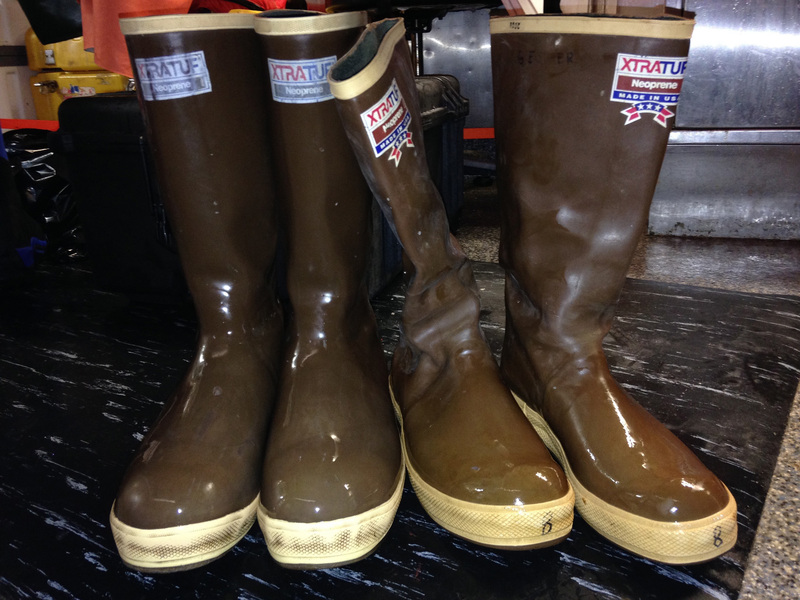 Whenever it’s time to process fish in the wet lab, I have to get geared up! What is the latest in fisheries fashion, you might ask? Rubber boots are a must. We take the lead of Alaskans and wear brown XtraTuf boots. Once I get my boots on, I put on my Grundens foul weather coveralls over my pants. The weather has been mild, so I have been forgoing the matching foul weather jacket and just wearing a long sleeved t-shirt or sweatshirt. I have not been wearing a hat, but I do pull my hair back. Lastly, I pull on elbow-length yellow rubber gloves over my sleeves. I am really enjoying my time with this ship’s crew and the rest of the science party. Everyone has been very welcoming, and, though we work hard, we maintain a sense of fun. If we have down time between data collection, Emily and I play cribbage. 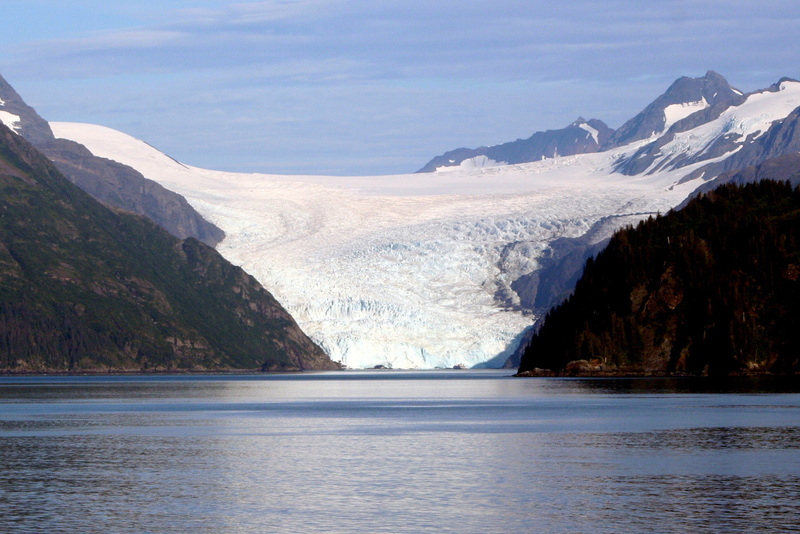 Or we go out on deck and take in the sights, like the Holgate glacier we passed the other day. Quite a few people on board have spent time in Hawai’i, so we can ‘talk story’ about the islands from all the way up here in the North Pacific. It is amazing how we are all connected in some way through our love of the ocean. 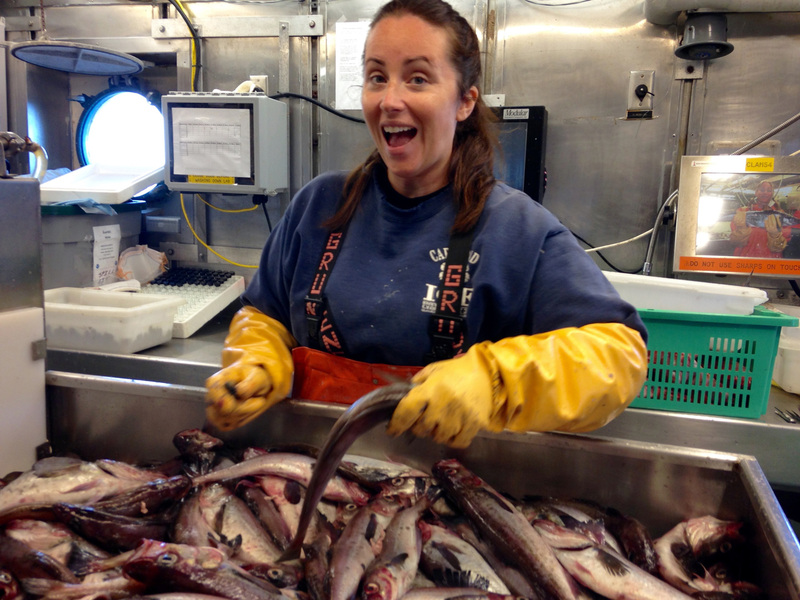 This entry was posted in 2015, Cristina Veresan, NOAA Fisheries Service, NOAA Teacher at Sea and tagged acoustic data, Acoustic Trawl Survey, Alaska Fisheries Science Center, Aleutian Wing Trawl, gulf of alaska, NOAA Ship Oscar Dyson, Walleye Pollock Survey. Bookmark the permalink.